Are you interested in volunteering? Volunteerism is the act of donating a person’s time, effort, and service without financial compensation. Although most volunteering positions are unpaid, applicants looking to make a difference and to gain valuable experience should consider sending an email message inquiring about such opportunities. See below for an example of an email sent to inquire about volunteer opportunities and tips for what to write when you want to volunteer. Cover letters for volunteering written to organizations are an effective way to indicate your interest in a specific volunteer position, as well as to describe how your skills, experiences, and background can better the lives of others. Like cover letters written for paid employment, those written for volunteer positions are most effective when they can highlight exactly how closely your background and/or interests fit the qualifications a group is looking for in its volunteers. 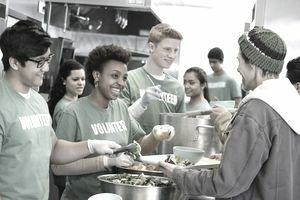 Like many paid jobs, organizations with volunteer positions available will often – but not always – publicly list the job openings they are looking to fill. Review these positions to find potential matches and to understand their requirements. Although volunteer opportunities are usually unpaid, the employer may still require certain qualifications for an applicant to be eligible. Before you begin drafting your cover letter, be sure to research the organization. Familiarizing yourself with the organization, its culture, and its mission can make you a stronger, more prepared candidate. Alternatively, learning about its operations may reveal that its values and mission are vastly different from your objectives – a sign that you should perhaps look for another organization to contribute your time and labor to. Volunteering opportunities are not always listed by an organization’s Human Resources department, so make sure you research who to contact and how best to reach them. When writing a cover letter for a volunteer position, mention your related work or volunteer experience, if applicable. Keep your cover letter professional, just like you would if you were applying for paid employment. Utilize this time to market yourself to the organization. This cover letter is your opportunity to introduce yourself and your intentions right off the bat. When drafting the letter, be sure to describe your interest in the position as well as your relevant experience and background. Provide examples of how you embody the organization’s mission statement, values, and core principles. In addition to your cover letter, include your resume. You may also want to include letters of recommendation written by personal or professional references who can describe and attest to your experience, skills, work ethic, and character. This is an example of a cover letter for a volunteer position. Download the volunteer position cover letter template (compatible with Google Docs and Word Online) or see below for more examples. I am interested in opportunities that may be available to volunteer at the St. John Senior Center. As a long-time advocate of the needs and welfare of the elderly in our community, I have experience working with senior citizens and would be thrilled to continue to do so in a volunteer capacity. I volunteered as an aide at the Champlain Center and enjoyed being able to help senior citizens with arts and crafts. In this position, I assisted program participants with recreational projects, contributed to program planning and strategy sessions, and accompanied group field trips to local musical events and museums. I also participated in fundraising and community outreach initiatives. If the St. John Center needs a dedicated volunteer, I would be thrilled to have the opportunity to assist you. My schedule is flexible, and I would be available to volunteer at your convenience. Eager to learn more about your mission, successes, and challenges in serving our senior citizens, I would be grateful for the opportunity to interview with you at a mutually convenient time. I look forward to speaking with you. The most effective format for cover letters can vary, depending upon the opportunities they are targeting. Review cover letter samples for a variety of career fields and employment levels, including an internship cover letter sample, entry-level, targeted and email cover letters.